If we are to fully understand how slavery survived legal abolition, we must grapple with the work that abolition has left undone, and dismantle the structures that abolition has left in place. Child Slavery before and after Emancipation seeks to enable a vital conversation between historical and modern slavery studies - two fields that have traditionally run along parallel tracks rather than in relation to one another. 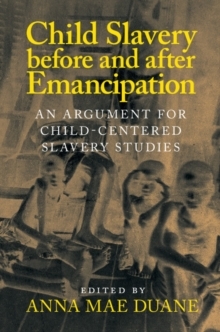 In this collection, Anna Mae Duane and her interdisciplinary group of contributors seek to build historical and contemporary bridges between race-based chattel slavery and other forms of forced child labor, offering a series of case studies that illuminate the varied roles of enslaved children. Duane provides a provocative, historically grounded set of inquiries that suggest how attending to child slaves can help to better define both slavery and freedom.